Recently, I came across a requirement where payments were made from a specific bank account. 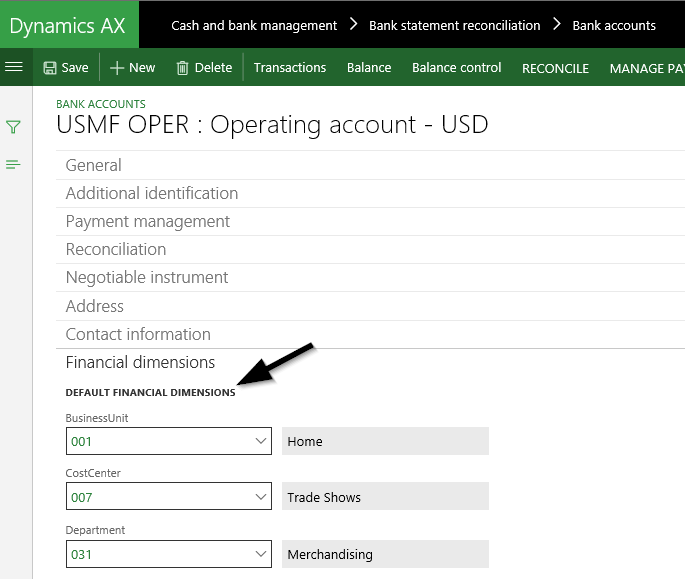 As only one single bank account was used for making the payments, the expectation was that Dynamics AX creates only one single posting on the bank account. 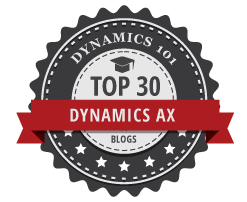 Dynamics AX did, however, create numerous bank postings – one for each journal line – as the invoices paid were recorded with different financial dimension combinations. 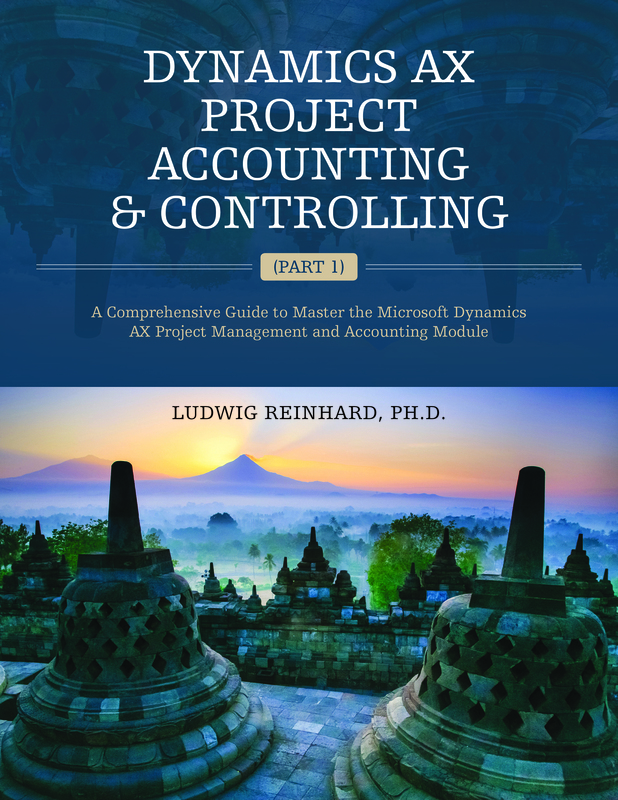 This fact made the bank reconciliation process more difficult because the bank deduced all vendor payments made in one single amount, which had to be matched with the numerous transactions recorded on the Dynamics AX bank account. 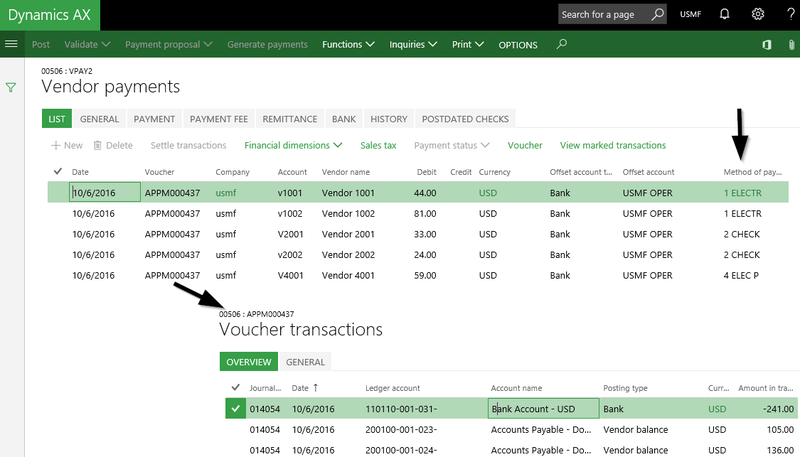 The next screenshots exemplify how the payment proposal was created and the vouchers and bank transactions resulting from posting the payment journal. 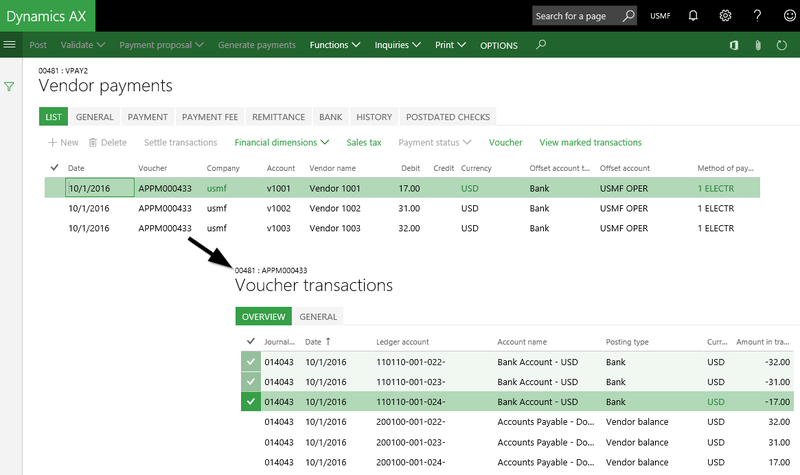 Note: Previously the parameter ‘new voucher’ was set to ‘in connection with balance’ and the ‘detail’ level was previously set to ‘details’. 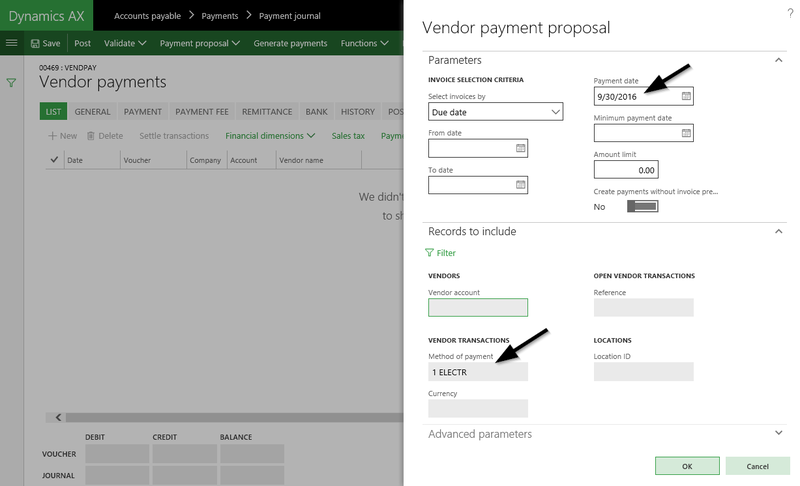 The result of this first change in the setup was that Dynamics AX created one single voucher for all lines included in the vendor payment journal. However, there were still a number of postings created on the company’s bank account, as the next screen-print illustrates. The underlying reason why Dynamics AX did not summarize the transactions made on the bank account were the different financial dimensions used at the invoice level that got inherited to the bank account. This can be identified from the previous screen-print, which shows that the bank account transactions were posted with the financial dimension ‘cost center’ no. 022, 023 and 024. In order to avoid this problem, default financial dimension values were setup at the bank account level. For details, please see the following screen-print. 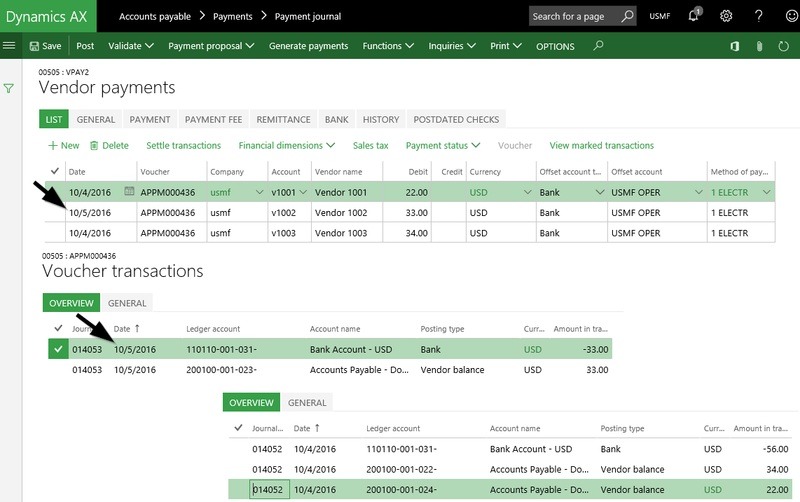 With this setup in place, the expectation was that only one single posting on the bank account is created when posting the vendor payment journal. However, the setup changes made had no influence on the outcome, as the next screenshot proves. Once again the financial dimension inheritance from the vendor invoice level that was overwriting the default financial dimension setup at the bank account level was the underlying reason that prevented a summary of the bank postings. To get the posting summary issue resolved, the main account associated to the bank account was finally setup with fixed financial dimension values, as illustrated next. 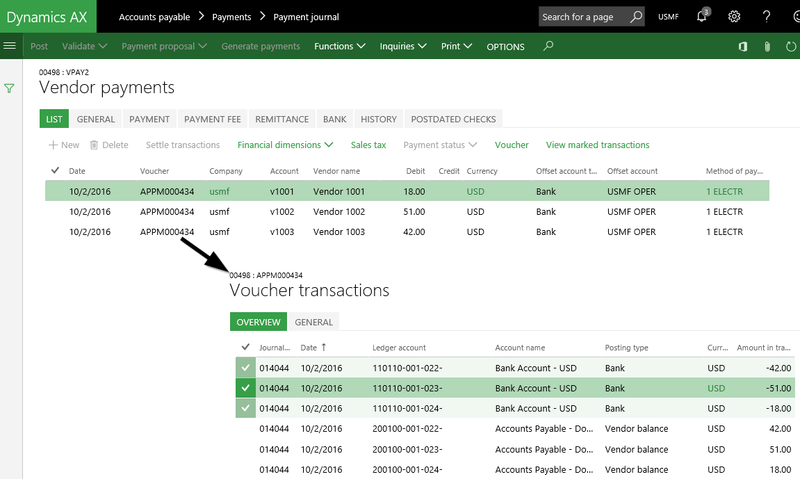 After creating another vendor payment journal, the following summarized voucher resulted, which shows only one single transaction on the bank account used. To test the stability and reliability of the setup made, another vendor payment journal was created. This time, different payment dates were used for the lines included in the journal. The outcome of this modified payment run was that Dynamics AX created several summarized bank postings – one for each day. The next screen-print shows the journal lines and the resulting vouchers. 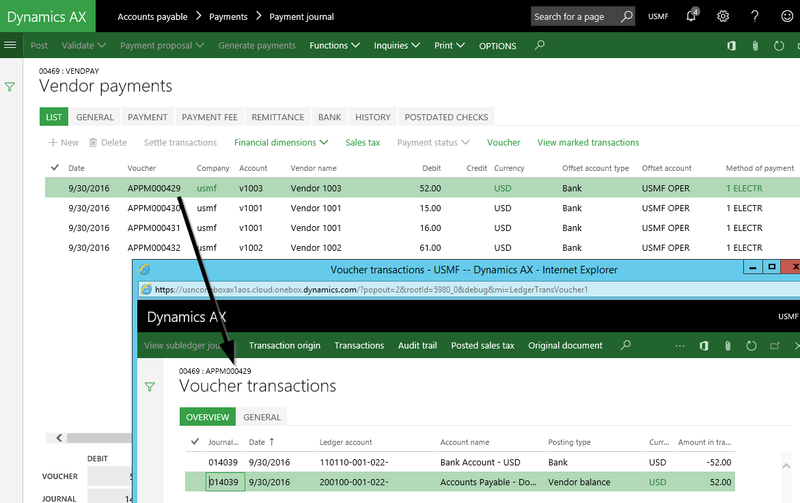 Note: The major problem with the vouchers generated in the example is that Dynamics AX uses the same voucher number for postings made on different dates. 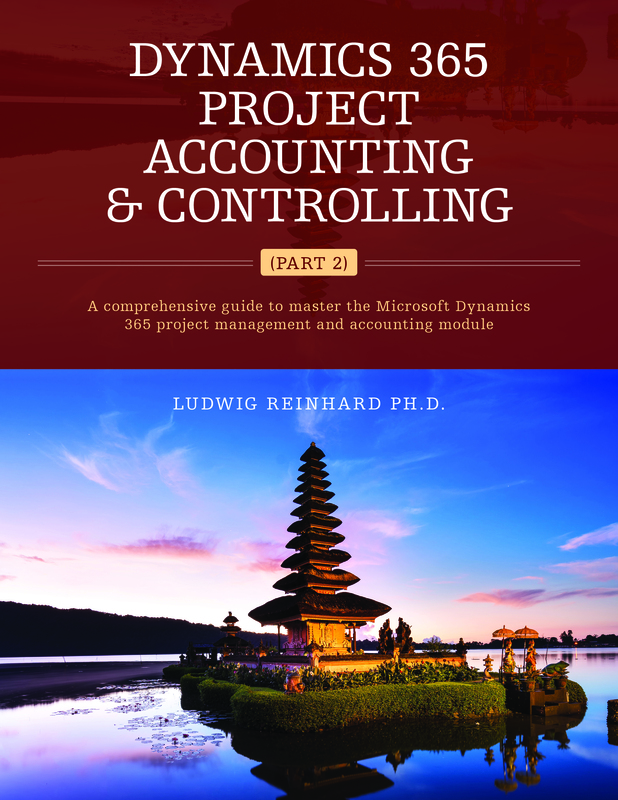 This outcome is likely to result in problems with the company’s auditors, as all accounting standards the author is familiar with, do not allow such kind of postings. The next modification made to test the stability of the setup was posting a payment journal with different methods of payments. The result of this second test run was that Dynamics AX still summarized all payments made in one single bank posting. For details, please see the next screen-print. Within this post the possible summary of payments made into one single bank posting was illustrated. 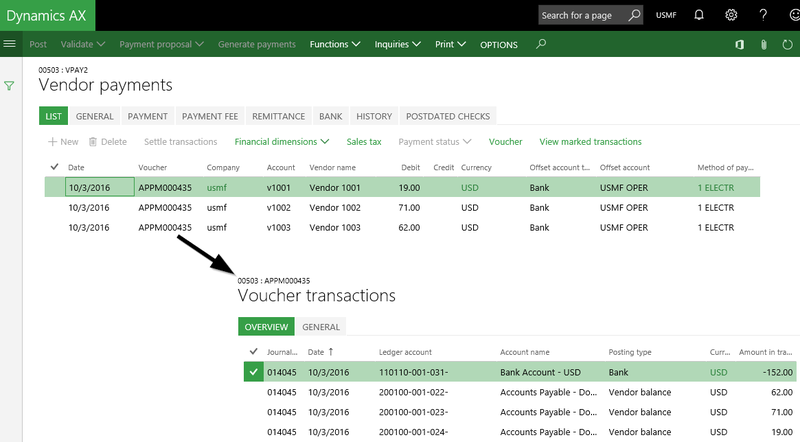 Please note that what has been shown above does also apply to bridge-payment scenarios where all vendor payments are initially made against a bridging ledger account that is in a second step posted against a bank / cash account. An important prerequisite of the posting summary illustrated is that the payment account used in the vendor payment journal is setup with fixed financial dimension combinations. Otherwise, the financial dimensions used at the invoice level get inherited to the bank / cash account and result in a large number of bank postings. In addition, it has been shown that the summary does only work as intended, if one single payment date is used in the payment journal. If this cannot be ensured, Dynamics AX will create vouchers that might be questioned by tax and corporate auditors.